The children of Munnagong Flats Public School think that a footbridge from one side of the river to the other will make it much easier for them to get to school. They tell their teachers, the teachers tell the Mayor and the Mayor consults with her Chief Engineer, Engilina. Join Engilina, her friend Engibear, and the children of Munnagong Flats Public School as they design, plan and build a footbridge across the river in this interesting picture book which works as both an engaging story and a fascinating account of the process of building a bridge from the original concept to the completed construction. It can be a tricky task to share information about science and maths-based subjects in a picture book. Biology and other natural sciences seem to blend fact with story more easily than engineering and maths, where it can be hard to find the balance between facts and figures, and an engaging story and relatable characters. Author/engineer Andrew King and illustrator/architect Benjamin Johnston have managed to do just that, however, with their Engibear picture book series. 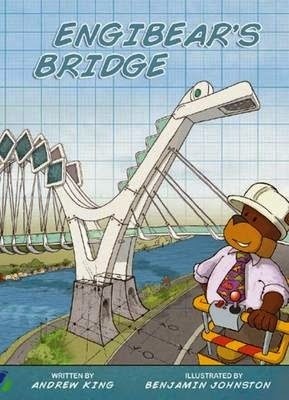 Engibear's Bridge, written in a pleasing rhyming style that flows well, gives an overview of what is happening with the process of planning and building the bridge, moving through a month-by-month update of the various stages of design, development and construction. The characters, which include both human and animal figures filling the various roles, are friendly and appealing. For those children whose interest in this topic extends beyond the superficial, there is a wealth of information and detail shared in the backgrounds of the illustrations. Details on different types of bridge, cross-sections of rigging, and comparisons of gradients, foundation types and construction materials will ensure that budding engineers have plenty of information to keep them entertained. Many of the bridge construction stages are also accompanied by images of the Munnagong Flats school students taking part in experiments and projects at school to test the same physics and engineering principles used for the construction of the bridge. As the mother of a mechanically-minded child, I am aware of just how hard it can be to find entertaining stories that also contain technical information. I am a huge fan of this series and can’t wait to see what aspect of engineering will be explored in the next book. There are currently two Engibear books available, Engibear’s Bridge and Engibear’s Dream, a story about building a Bearbot robot. A third book is currently in the planning stages. Engibear books are great for reading at home and are ideal to have on hand in a classroom setting.